Introducing the THOR freestanding 3 burner natural gas radiant chargrill. Named after the Norse God reputed for his strength the THOR range is here to prove it is as strong as its name's sake. With a huge 36in wide cooking area, the Thor freestanding gas chargrill is the ideal choice for any commercial kitchen requiring high volume output. 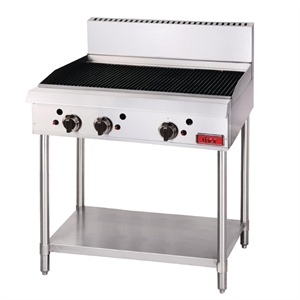 Featuring heavy duty cast iron grilling grates and independently controlled manual cooking zones, the Thor chargrill is perfect for cooking steaks, chops, hamburgers and seafood with the popular chargrilled look and taste. In addition, the unit is sold complete with the sturdy stand and undershelf. Delivery up to 3 days. THOR appliances will soon be available to view in our showroom, please call and arrange a viewing.